While researching the place I’m living in I came across the local website which included a notice on the Remembrance Day ceremony held today at 11.30 am. 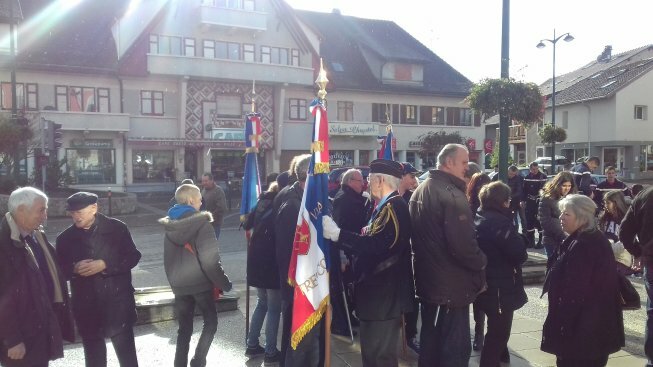 All across France it’s the same, every town and every village holding a ceremony including the Mayor, veterans, the local police, firebrigade, local children and others. It’s only a five minute walk from where I live now so thought I’d go along, not having been to a Remembrance Day service in ages. Fortunately I found a suit in the garage, put that on and dug my old beret out. 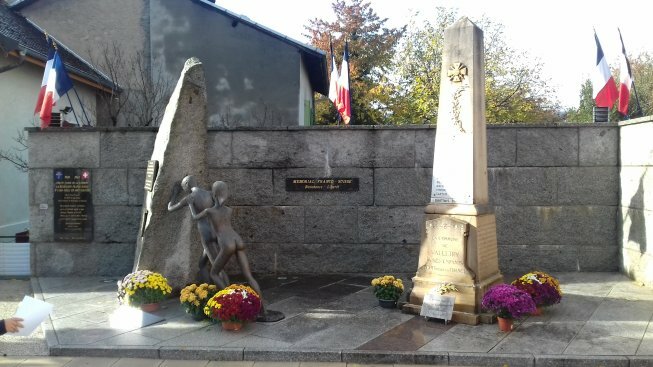 Not having been to a service in the UK in a long time I don’t have much to compare it to but it was a very moving service in the open air in front of the Marie which is where the ‘Monument aux Morts’ (Monument to the Dead) is located. Short speeches were given by the Mayor, veterans and schoolchildren who are an important part of the service. Before the ceremony I intoduced myself to the veteran you can see below and shortly after that I was approached by a couple of the officials and asked who I was and who I was representing, as it turns out I represented the British Army and took part in the ceremony and was the first to salute the colours (flags) at the end of the speeches, it was quite moving. Afterwards it was drinks all round, it is France. Now I know the mayor, the local police and fire brigade, which is something I never managed in twenty years in Switzerland. Would you live somewhere you hate?